Nagara-gawa (Nagara River) Bridge, c. 1920. “The main part of the [Nagara-gawa] bridge consists of nine independent thrust girders of wide span. The piers at the two ends of one of these girders are completely wrecked and the girders have fallen bodily into the bed of the river. The piers on either side of the two mentioned are partly wrecked and the girders between them and the first mentioned girders rest each with one end in the river bed the other on the top of the partly destroyed pier. “The remaining girders are in their original positions or nearly so. It will again be observed that the portion of the bridge which has fallen relative to the part which remains standing has been thrown some distance out of a straight line. Examination has shown that this displacement is not simply a displacement of the upper work of the bridge but the ground with the screw pile foundations has been shifted a distance of several feet up the stream. “The view of Kinkwa-san [mod. 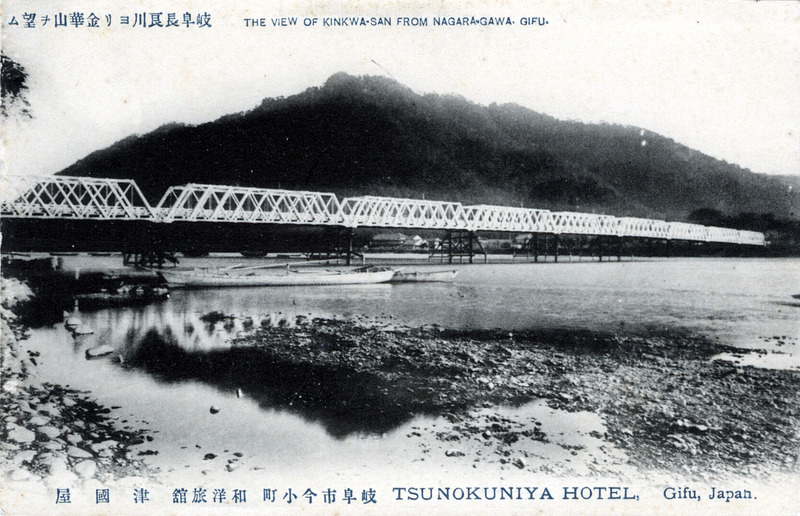 Kinka-zan] from Nagara-gawa”, Gifu, c. 1910. The bridge, of British design, was damaged in an 1891 earthquake but was repaired. “Earth fissures are seen everywhere, some of them as much as six feet wide and twenty or more feet deep. The effects produced on engineering structures are in many cases extraordinary. One brick railway arch between Nagoya and Gifu collapsed in consequence of its abutments, 14 ft. high and 5 ft. thick, having been thrown apart in opposite directions. The roadway beneath has a transverse crack four inches wide.